I have been wanting to make Hanukkah blessing cards at home for a few years. Don’t get me wrong, reading blessings from the Siddur certainly feels authentic but I have wondered for years if the Siddur and Hanukkah are the best match. There is lots of burning wax and tables of (unfortunately mostly oily) food. Might there be a better way to present the Hanukkah blessings? I really appreciate that the Hanukkah blessings are available on-line. And with these you can hustle and cut and paste the blessings into a new document. Sometimes you can find a plain PDF download of the blessings for printing. Both solutions feel like a letdown and definitely does not add to any “special” holiday ambiance. Might there be a more aesthetically pleasing design solution for the Hanukkah blessings? Last year I again felt a pang of disappointment that I was not more organized and had not prepared individual blessing cards for everyone in our family and for our guests. This year, I did it. 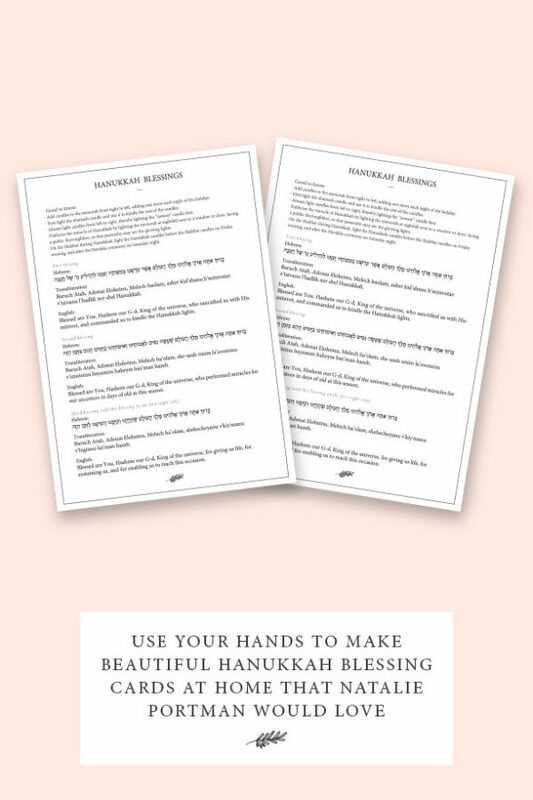 I created the modern, beautiful and useful printable Chanukah blessings that I have been wanting. These blessing cards offer simplistic design with natural elements. You can print them on heavy stock paper or a heavier paper with a texture that enhances the design. I laminate mine. Either way, we can use these blessing cards for each night of Hanukkah and as long as you do not dip them in oil or mush a latke on top of them, they can be used next year too. These Hanukkah cards are available for immediate download and comes in a high quality (300 dpi) PDF file for ease of printing. When you download the file you will receive one PDF that contains two Hanukkah blessings cards. These printable Hanukkah blessing cards are simple to put together. Use these blessing cards each night of Hanukkah. Your turn: Please share a Hanukkah blessings mistake/mishap story with us in the comments below? Previous What’s In Your Pantry, Yael Trusch?